My JakJak has been getting spoiled rotten the past month with all the yummy treats he has been getting in the mail. Thankfully they’ve all been All Natural dog treats. DOGSWELL dog treats are All Natural. They are made from natural meat and poultry. They have no added hormones, processed gluten, artificial colors, flavors or preservatives. All the treats and food are wheat, corn, soy, and flour free. They do not contain BHA, BHT or Ethoxyquin. 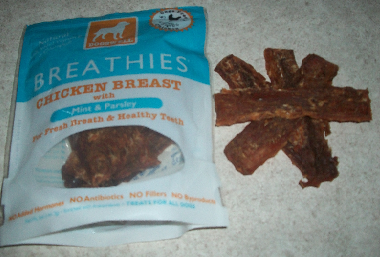 The Breathies dog treats contain mint and parsley for fresh breath and healthy teeth. This is one of my dog’s favorites. They are nice and chewy. These dog treats are rich in protein and low in fat. They are also easily digested. Ingredients: Chicken Breast, Vitamin E Supplement, Mint, Cinnamon Bark, Oyster Shell Flour, rosemary, parsley, and Chlorophyll. These treats are made in China. 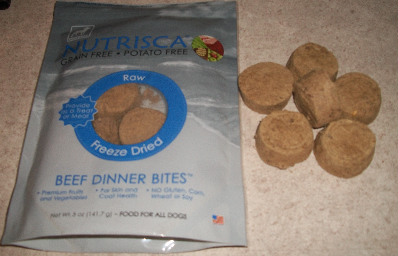 The Nutrisca Freeze Dried Raw Dog treats can be used as a meal or treat. I use them as a treat or crumble a few over his normal food. These treats are a nice texture change for your dog. The dinner bites are made with premium fruits and vegetables, No Gluten, Corn, Wheat or Soy. 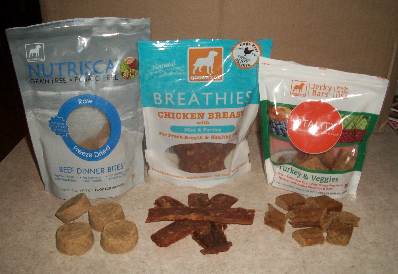 These treats are great for your dog’s skin and coat health. Nutrisca is made from a raw material such as Beef ground bone, beef heart, beef liver, beef kidney, apples, chickpeas, peas, flaxseed, and more. They are then freeze dried, which locks in the nutrients of each ingredient. These treats are made in the USA. The Vitality dog treats from DOGSWELL helps maintain eyes, skin, and coat. These treats are Antioxidant rich with Omega fatty acids. These treats have added vitamins and zinc. The number 1 ingredient in these Jerky Bars is Turkey. 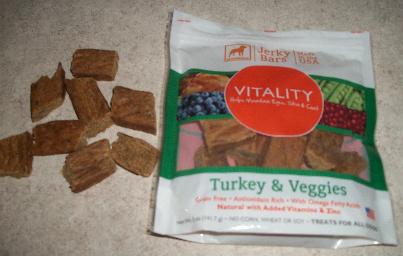 The Vitality Treats are nice a chewy, a texture my dog seems to enjoy. Some other ingredients are carrots, blueberries, flaxseed, cranberries, and spinach. DOGSWELL provides pure nutrition with natural benefits! DOGSWELL offers Jerky treats, wraps, canned food, dry food, and biscuits. They also have six functional formulas: Shape Up, Happy Hips, Vitality, Breathies, Mellow Mut and Happy Hearts. Disclosure: I was not compensated for this product review. All opinions are my own and you may differ from mine.